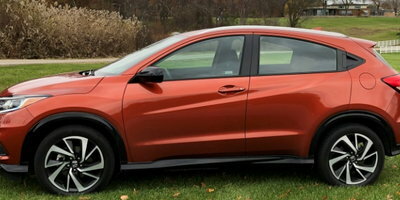 Following the awkward second-generation Insight, Honda went back to the drawing board to give us what we always thought was possible: an all-new hybrid sedan with a sophisticated new look, and an inspired powertrain that returns impressive fuel economy, paired with a nice-handling chassis tuned for comfort. The latest Insight comes to market with a slick, sophisticated design that can trace its lineage to the rest of Honda's lineup, while avoiding the Civic's adolescent boy racer-inspired styling cues. 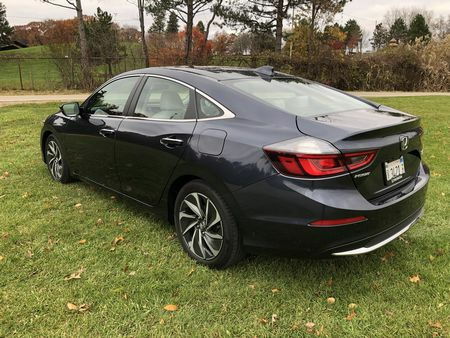 So while the Insight's roofline and 103.7-inch wheelbase may match that of the Civic, both fascias take design cues from the larger, more mature, Accord. Up front, an aggressive grille and narrow, elongated, headlamp enclosures are topped by a bright chrome trim strip that, as it wraps around the upper fascia, narrows to a point at the trailing edge of the headlamp enclosures. Body sculpting along the sides is also toned down vis-à-vis the Civic, with graceful wheel arches and fewer creases along the flanks. In back, wide taillights wrap around the upper rear portions of the quarter panels, tapering as they reach the trunk lid. The large rear glass negates the need for an awkward-looking (and by most accounts, fairly useless) split window design, while, above the taillights, an indentation where the high decklid meets the rear fascia creates a built-in spoiler, marking the termination of the steeply-raked roofline. 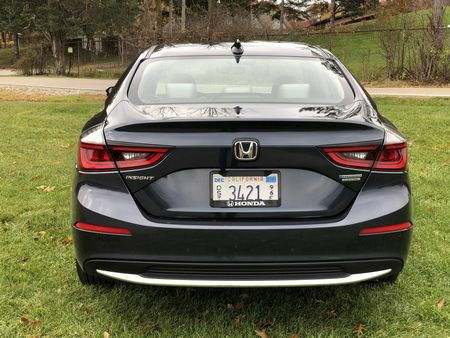 In all, the Insight's understated design is much more approachable than either of the old models, and we believe the handsome new look will finally make Honda's compact hybrid a legitimate contender against the Area 51-inspired Prius. 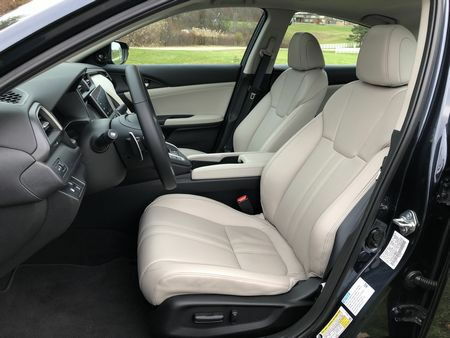 Completely redesigned and re-engineered for 2019, the interior is logically laid out and boasts of quality, soft-touch materials. In typical Honda fashion, all controls are within easy reach of the driver, intuitive, and operate smoothly. There's great outward visibility all around, comfortable seats, and an intuitive infotainment system shared with the Accord offering redundant steering wheel controls for station pre-sets and volume. 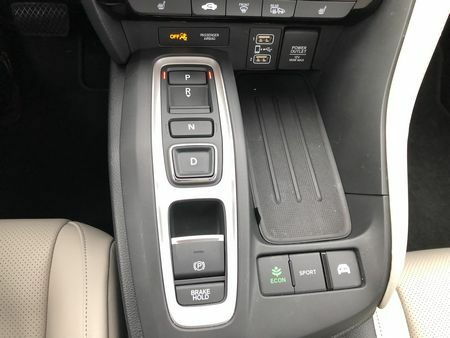 The four drive-by-wire transmission buttons are all shaped and angled differently, that, with a bit of practice, allow drivers to select the correct one simply by touch. 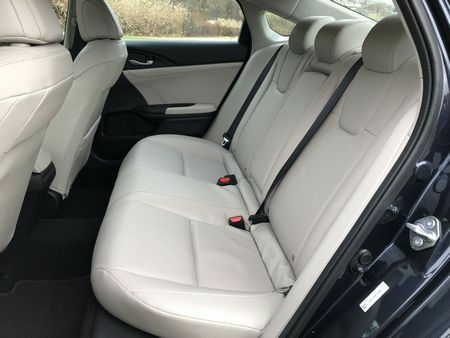 Space-wise, there's ample room both up front (39.3 inches of headroom, 42.3 inches of leg room) and in back (36.9 inches of headroom, 37.4 inches of leg room) for four adults, along with 15.3 cubic feet of cargo space in the trunk, and a rear seatback that folds (on the EX and Touring with a 60/40 split), with a pass-through large enough to transport a 52cm road bike without having to remove the front wheel. 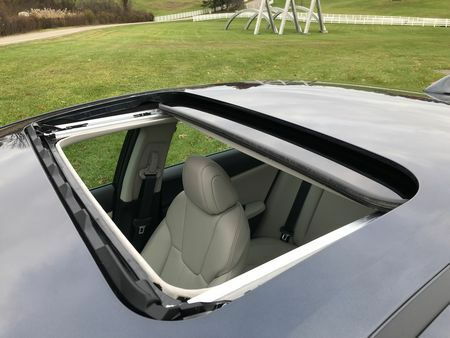 Thanks to a low beltline, cowl, narrow A-pillar, wide front and rear windows, and a window in the C-pillar, the driver’s view out the front, sides and rear three-quarters is excellent. But a high deck lid reduces rear visibility - although it's much better than the Prius. We're also getting the hang of Honda's LaneWatch right outside rearview mirror-mounted camera - automatically activated by flipping the right turn signal or manually activated any time by pushing a button on the end of the turn signal stalk. 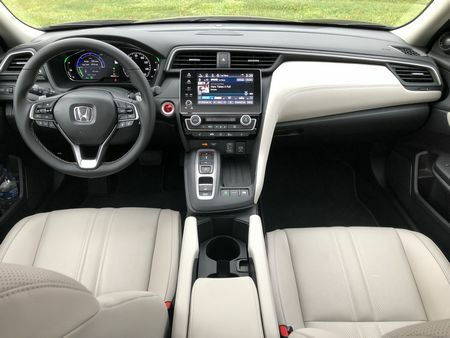 Standard alongside Honda Sensing (which means a no-go on the LX), it's especially handy on the freeway, as you can activate it to view the right rear blind spot on the infotainment screen. We only wish there was a system for the left side, as well. 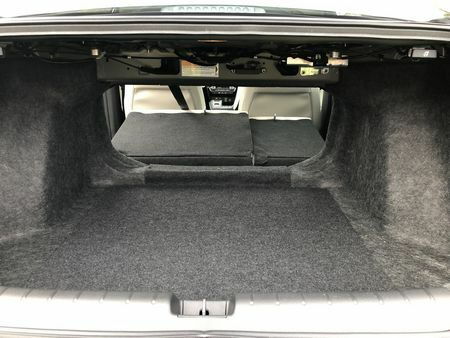 In addition to that, nits are few: although the LX rear seat folds, it lacks the 60/40 split found on other trims, the sedan body isn't as versatile as a hatchback and, despite one of the better active noise cancellation systems, when traveling over tough pavement, road and tire noise makes its way into the cabin. 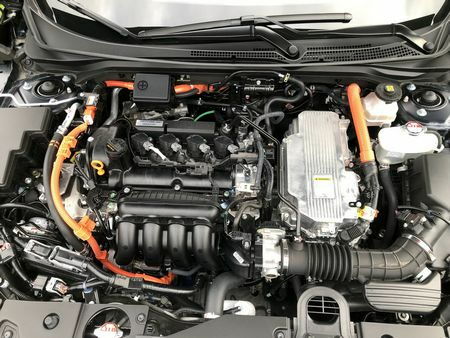 The Insight's hybrid drive system consists of 1.5-liter Atkinson-cycle four-cylinder engine that develops 107 horsepower and 99 lb-ft of torque coupled to dual electric motors that produce 129 horsepower and 197 lb-ft of torque. 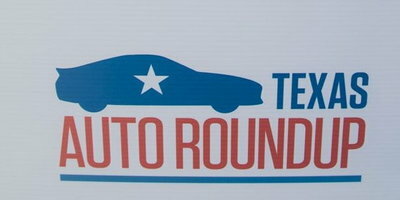 Total output for the hybrid system is 151 horsepower. 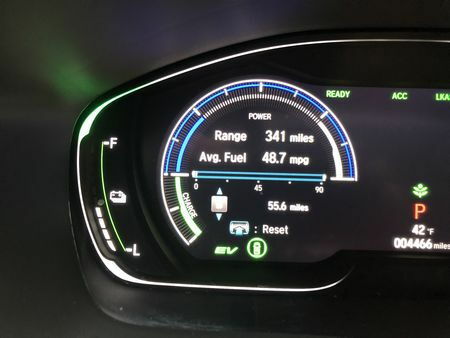 Fuel economy is an EPA-estimated 51 miles per gallon in the city, 45 on the highway, and 48 combined, while our own observed fuel economy was a vehicle-measured 47.7 miles per gallon in some fairly aggressive suburban driving. 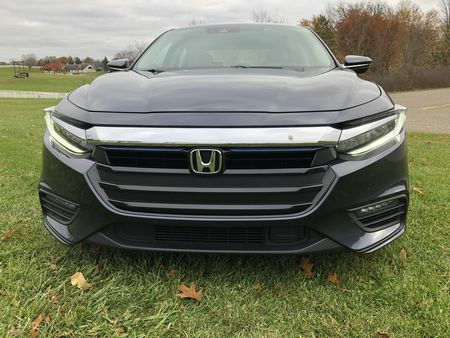 Even with the proliferation of hybrids, the Insight is rather unique - the biggest difference being Honda's "two-motor hybrid" system that doesn't use a traditional transmission. Instead, the Insight features a fixed gear ratio between both the gas engine and one of the electric motors. Under certain circumstances, the electric motor can directly drive the front wheels, while at higher speeds, the gas engine kicks in and all three clutch together through a direct fixed-ratio drive. By skipping the need for a conventional transmission, the system typically relegates the gasoline engine to operate as an electric generator. For drivers, it's an experience that's noticeably different in that acceleration and the gasoline engine aren't always directly proportional. In some instances, the gas engine is charging up the electric motor when you wouldn't expect it to be kicking in. On the other hand, there are situations where you'd expect the engine to contribute, but it doesn't. Both scenarios happen every now and then, although the uniqueness should wear off in time. Compared to other hybrids, the Insight feels more responsive, with its direct-drive transmission-lacking system offering a better burst off-the-line, easily out-accelerating other hybrids in the class - especially the Prius. Riding atop a modified version of the Civic's underpinnings, the Insight inherits that vehicle's top-shelf fluid-filled bushings, multi-link rear suspension and, largely, its trademark ride and handling excellence. There's very little body lean in corners, road imperfections are handled with ease, and the Insight remains relatively unperturbed over rutty pavement. The 16-inch wheels on base and EX trims with bigger sidewalls should have more give, but even the 17-inch wheels that were standard on our Touring tester offered a smooth ride. There's a decent amount of feedback through the steering wheel, and the brakes are easy to modulate – switching between friction and regenerative braking seamlessly - while offering excellent stopping power. At the same time, even with three levels of regenerative braking - operated by the steering wheel-mounted paddle shifters - the Insight still lacks one-pedal driving capability. Additionally, while off-the-line performance is impressive, passing at freeway speeds, as well as on back roads, requires some advanced planning. Finally, the engine, when really pressed, emits an unrefined drone. 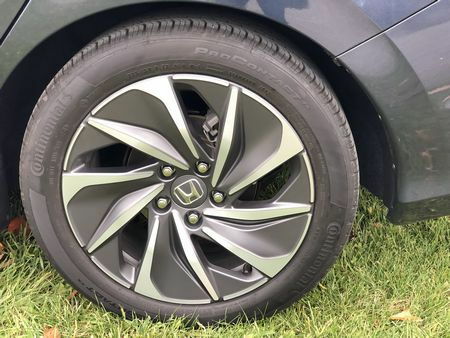 The 2019 Honda Insight is offered in three mono-spec trim levels, the only options being a handful of dealer-installed interior and exterior accessories. 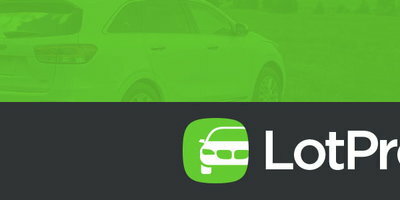 2018 Insight pricing starts at $23,785 for the LX trim – about $2,400 cheaper than the hybridized Accord - and, in addition to the usual power bits, includes 16-inch alloy wheels, LED headlights, daytime running lights, taillights, and console lighting, automatic climate control, keyless push-button start, a 5-inch LCD screen, a 160-watt, 6 speaker audio system, Bluetooth, and the Honda Sensing suite of advanced safety features that includes a rear view camera, pre-collision warning, automatic emergency braking, lane departure warning, and road departure mitigation. 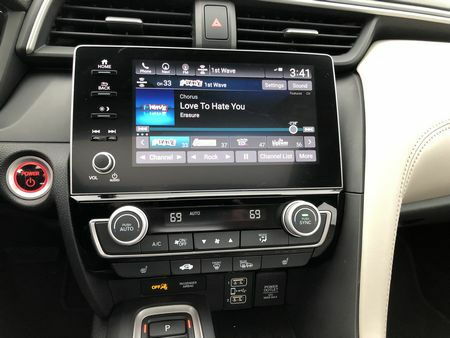 Stepping up to the $24,955 mid-level EX, adds fog lights, smart entry, a rear seat center armrest, an eight-inch color touchscreen, satellite radio,180-watt 8 speaker audio system, Apple CarPlay and Android Auto functionality, Honda LaneWatch, and remote engine start. The top-shelf Touring model, like our $28,985 Cosmic Blue tester, adds 17-inch alloy wheels, LED fog lights, side mirrors with LED turn indicators, rain-sensing wipers, leather seating (heated and powered in front), a moonroof, 450-watt audio system with subwoofer, satellite-linked navigation with HD digital traffic, dual-zone automatic climate control, mobile hot spot capability, and an auto-dimming rearview mirror. 2019 marks a watershed moment for Honda's compact hybrid. No longer an undersized two-seater or wacky hatchback, the Insight has morphed into a mature, lithesome sedan even as the Toyota Prius has taken a swan dive into the deep end of a Star Trek-inspired styling pool. 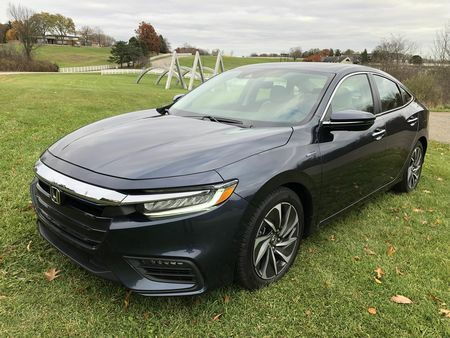 So despite occasional engine drone, and the lack of Apple CarPlay and Android Auto on the base model, fantastic fuel economy, comfortable ride, solid handling, and standard advanced safety features make the 2019 Honda Insight a top choice in its class.